Wangari Maathai was born in the village of Ihithe, near Nyeri, in the Central Highlands of Kenya on April 1, 1940. At a time when most Kenyan girls were not educated, she went to school at the instigation of her elder brother, Nderitu. Principally taught by Catholic missionary nuns, she graduated from Loreto Girls’ High School in 1959. The following year she was part of the “Kennedy airlift,” a scholarship program of the U.S. government and the Kennedy family that took her to Mount St. Scholastica (now Benedictine College) in Atchison, Kansas, where she completed a bachelor’s degree in biological sciences. Professor Maathai suggested to them that planting trees might be an answer. The trees would provide wood for cooking, fodder for livestock, and material for fencing; they would protect watersheds and stabilize the soil, improving agriculture. This was the beginning of the Green Belt Movement (GBM), which was formally established in 1977. GBM has since mobilized hundreds of thousands of women and men to plant more than 47 million trees, restoring degraded environments and improving the quality of life for people in poverty. As GBM’s work expanded, Professor Maathai realized that behind poverty and environmental destruction were deeper issues of disempowerment, bad governance, and a loss of the values that had enabled communities to sustain their land and livelihoods, and what was best in their cultures. The planting of trees became an entry-point for a larger social, economic, and environmental agenda. In the 1980s and 1990s the Green Belt Movement joined with other pro-democracy advocates to press for an end to the abuses of the dictatorial regime of then Kenyan president Daniel arap Moi. Professor Maathai initiated campaigns that halted the construction of a skyscraper in Uhuru (“Freedom”) Park in downtown Nairobi, and stopped the grabbing of public land in Karura Forest, just north of the city center. She also helped lead a yearlong vigil with the mothers of political prisoners that resulted in freedom for 51 men held by the government. As a consequence of these and other advocacy efforts, Professor Maathai and GBM staff and colleagues were repeatedly beaten, jailed, harassed, and publicly vilified by the Moi regime. Professor Maathai’s fearlessness and persistence resulted in her becoming one of the best-known and most respected women in Kenya. Internationally, she also gained recognition for her courageous stand for the rights of people and the environment. Professor Maathai’s commitment to a democratic Kenya never faltered. In December 2002, in the first free-and-fair elections in her country for a generation, she was elected as Member of Parliament for Tetu, a constituency close to where she grew up. In 2003 President Mwai Kibaki appointed her Deputy Minister for the Environment in the new government. Professor Maathai brought GBM’s strategy of grassroots empowerment and commitment to participatory, transparent governance to the Ministry of Environment and the management of Tetu's constituency development fund (CDF). As an MP, she emphasized: reforestation, forest protection, and the restoration of degraded land; education initiatives, including scholarships for those orphaned by HIV/AIDS; and expanded access to voluntary counseling and testing (VCT) as well as improved nutrition for those living with HIV/AIDS. In the violence that followed the contested 2007 Kenyan elections, Professor Maathai served as a mediator and a critical voice for peace, accountability, and justice. In addition, she and GBM were instrumental in ensuring that the new Kenyan constitution, ratified by a public vote in 2010, included the right of all citizens to a clean and healthy environment, and that the constitution’s drafting was truly consultative. In 2006 Professor Maathai co-founded the Nobel Women’s Initiative with five of her fellow women peace laureates to advocate for justice, equality, and peace worldwide. In recent years Professor Maathai played an increasingly important role in global efforts to address climate change, specifically by advocating for the protection of indigenous forests and the inclusion of civil society in policy decisions. In 2005 ten Central African governmentsappointed her the goodwill ambassador for the Congo Basin rainforest and that same year she accepted the position of presiding officer of the African Union’s Economic, Social, and Cultural Council (ECOSOCC). In 2006 Professor Maathai joined with the United Nations Environment Programme (UNEP) to launch a campaign to plant a billion trees around the world. That goal was met in less than a year; the target now stands at 14 billion. 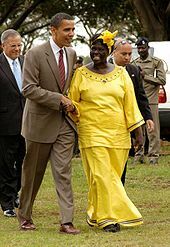 In 2007 Professor Maathai became co-chair (with former Canadian Prime Minister Paul Martin) of the Congo Basin Forest Fund, an initiative of the British and Norwegian governments, and in 2009 she was designated a United Nations messenger of peace by Secretary-General Ban Ki-moon. In 2010, Professor Maathai became a trustee of the Karura Forest Environmental Education Trust. That same year, in partnership with the University of Nairobi, she established the Wangari Maathai Institute for Peace and Environmental Studies (WMI). The WMI will bring together academic research—e.g. in land use, forestry, agriculture, resource-based conflicts, and peace studies—with the Green Belt Movement approach and members of the organization. Through sharing their experiences, academics and those working at the grassroots will learn from and educate each other on the linkages between livelihoods and ecosystems. Professor Maathai received a number of honors. Those bestowed on her by governments include: the Order of the Rising Sun (Japan, 2009), the Legion D’Honneur (France, 2006), and Elder of the Golden Heart and Elder of the Burning Spear (Kenya, 2004, 2003). Professor Maathai also received awards from many organizations and institutions throughout the world, including: the Nelson Mandela Award for Health and Human Rights (2007), the Kenya National Commission on Human Rights Lifetime Achievement Award (2006), the Sophie Prize (2004), the Goldman Prize (1991), the Right Livelihood Award (1984); and honorary doctorates from Yale University and Morehouse College in the U.S., Ochanomizu University in Japan, and the University of Norway, among others. Professor Maathai documented her life, work, and perspectives in four books: The Green Belt Movement: Sharing the Approach and the Experience (2003), which charts the organization’s development and methods; Unbowed (2006), her autobiography; The Challenge for Africa (2008), which examines the social, economic, and political bottlenecks that have held back the continent’s development, and provides a manifesto for change; andReplenishing the Earth: Spiritual Values for Healing Ourselves and the World(2010), which explores the values that underpin the Green Belt Movement and suggests how they can be applied. Professor Maathai is survived by her three children—Waweru, Wanjira, and Muta, and her granddaughter, Ruth Wangari.